IF YOU HAVE IMMEDIATE CONCERNS ABOUT A CHILD CALL CHILDREN’S AID IMMEDIATELY. Click here for your local Children’s Aid Society. If you see or have reason to believe a child is in need of protection or is at risk of harm, make the call to your local Children’s Aid Society. There is someone available to receive your call 24 hours a day, 365 days a year. It can be hard deciding to place a call to report concerns for a child or youth. We understand the emotions and worries that can come up before calling Children’s Aid. Ultimately, the biggest consideration is and should be for the safety and well-being of the child and/or family. If you suspect child abuse or neglect, please call your local Children’s Aid Society. In 2018, the age of protection was raised to include youth up to 18 years old. Youth who are 16 and 17 years old are now eligible to receive protection services from Children’s Aid Societies. While reporting for 16 and 17-year old youth is not mandatory, please contact your local Children’s Aid Society if you have concerns about a youth. It is not your responsibility to determine whether abuse or neglect has occurred. Children’s Aid is responsible for investigating and assessing the need for protection or involvement. Filing a report to Children’s Aid does not prove abuse or neglect, but allows authorities to take the appropriate actions to determine the risk of each situation. Each report will be investigated and the situation will be evaluated to ensure the child and family receives the support necessary to keep the child safe. While confidentiality cannot be assured when making a referral, concerns about being identified should be shared with the Children’s Aid Society. It is possible to make an anonymous referral to a Children’s Aid Society by not providing any identifying information about yourself. When you call, you will speak to a child welfare specialist who is specially trained to listen to your concerns and ask questions before deciding how urgent the situation is and what type of intervention is needed. If a child is in imminent danger, a child protection worker will respond immediately. Children’s Aid workers are professionals who evaluate your information using comprehensive guidelines to determine the risk in each situation. 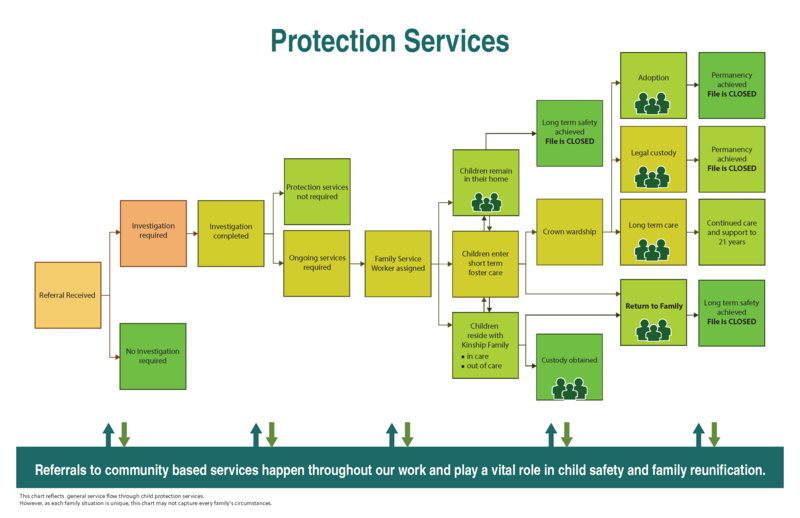 Child protection workers, using clear standards and guidelines, determine the kind of support and service needed to keep children safe in situations involving child maltreatment. A typical response to a child protection concern will include checking a computer database to see if the family or child has been involved with Children’s Aid in the past. Many factors are considered when determining how to investigate your concerns, including the age of the child, presence of physical injuries and other red flags that may indicate risk of harm. Every report received by Children’s Aid is reviewed by a child protection worker who then consults with a supervisor to determine the appropriate response time. Individual circumstances and level of risk for the children involved determine the response times. The Toronto Police Service reminds the public of its duty to report child abuse.